The viol (also called viola da gamba and lira da gamba) is any one of a family of bowed, fretted, stringed musical instruments developed in the 1400s and used primarily in the Renaissance and Baroque periods. The family is related to and descends primarily from the Spanish vihuela(a guitarlike plucked string instrument) and the lira, a bowed instrument developed in the Byzantine Empire in the 9th century. Viols most commonly had six strings, although many 16th-century instruments had five or even four strings. Viols were (and are) strung with low-tension gut strings, unlike the steel strings used by members of the modern violin family. Gut strings produce a sonority far different from steel, the former generally described as softer and sweeter. Viols are fretted in a manner similar to early guitars or lutes, by means of movable wrapped-around and tied-on gut frets. Unlike members of the violin family, which are tuned in fifths, viols are usually tuned in fourths with a major third in the middle, mirroring the tuning employed on the vihuela de mano and lute during the 16th century and similar to that of the modern six-string guitar. Alternate tunings (called scordatura) were often employed, particularly in the solo lyra viol style of playing, which also made use of many techniques such as chords and pizzicato, not generally used in consort playing. There is a vast repertoire of viol music, some by well-known composers such as Marin Marais, and much by anonymous ones. 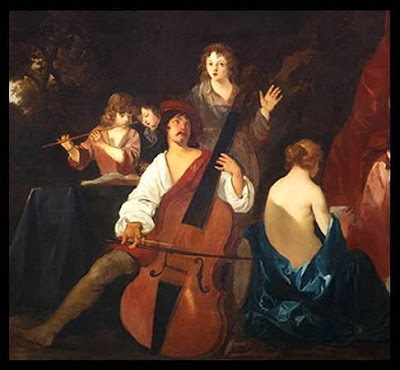 Much viol music predates the adoption of equal temperament tuning by musicians. The movable nature of the tied-on frets permits the viol player to make adjustments to the tempering of the instrument, and some players and consorts adopt meantone temperaments, which are arguably more suited to Renaissance music. There are several recognized fretting schemes in which the frets are spaced unevenly in order to give "better-sounding" chords in a limited number of keys. In some of these schemes, the two strands of gut that comprise the fret are separated so that the player can finger a slightly sharper or flatter version of a note to suit different circumstances. Personally, I find equal temperament fretting works best on the viol. You never play in equal temperament--you let your ear be the guide, and adjust accordingly, especially on 3rds. You can adjust a note by pressing harder or lighter (this works most effectively on treble or tenor). There are problems with trying to tune the fretting for any particular key--different strings often don't sound exactly true, from age or type of string. It's best to adjust according to your ear. As for splitting the fret, if there is any treatise, or any painting of a viol from any pre-20th century that shows that, I'm not aware of it. Adjustments according to one's ear is the historically-informed way to go. For those interested in hearing some of the worlds most accomplished viol players, please investigate the ensemble Phantasm when they are in Dunedin this May. Their performance will include some sublime Renaissance music from the Elizabethan and Jacobean.